Bluefin tuna, nearly extinct. Photograph courtesy Prof. Ransom Myers, Dalhousie University, Halifax, Nova Scotia, Canada. May 16, 2003 Halifax, Nova Scotia - For years, marine biologists have warned that many ocean creatures are facing elimination in the largest extinction event since the dinosaurs were hit by a big asteroid. Now comes a major ten-year-long study reported in Nature this week that concludes only 10% of big ocean fish are left, compared to their populations 50 years ago. 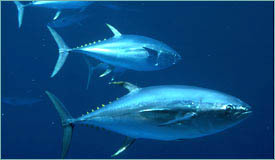 In the tropics, the guitar fish and grouper are nearly gone; off the coast of Newfoundland, the cod, haddock and halibut have never replenished; and in the open oceans the magnificent large predators - sharks, bluefin tuna, gilfish, swordfish, marlin - that have dominated for so long are down to their lowest numbers on record.